Boxer Stephen Simmons insists he belongs at the top table of the cruiserweight division despite his controversial defeat to Germany’s Noel Gevor in Hamburg on Friday night. 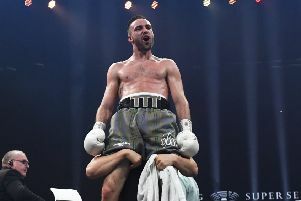 The Edinburgh MGM fighter was left stunned as the referee raised Gevor’s arm and not his after their 12-round WBO International title bout – Simmons losing on a split decision to his undefeated opponent at the Inselparkhalle Arena. It’s just the second loss of the 32-year-old’s professional career and one Simmons is still trying to get his head around. That said, he accepts nothing can be done to overturn the ruling and will instead choose to take comfort from the many positives to emerge from the contest. “There’s absolutely nothing we could have done differently, the judges are the reason I’m sitting here without another win to my record,” Simmons told the Evening News. “It didn’t help that one of the judges was German himself. The referee was also German and he never helped much as he kept trying to split us up so he could let Gevor run. “Even after the fight when we shook hands, I was up on the ropes clapping my hands and the whole place was responding to me as even they knew I’d done enough to win. But I never got the decision somehow. Judging by his body language when they were reading out the scores, he didn’t think he’d won it either. “Obviously, I have my second loss on my record but, because of the calibre of the fight, my ratings have gone up. “The step up in class was massive so we can’t go back – the Board wouldn’t allow me to fight anyone that’s really poor. They’re going to have to get more fights of this calibre. To rub salt into his wounds, Simmons revealed he was approached by a member of the local press in the aftermath, who was sympathetic towards the Scot. Simmons, however, takes great satisfaction from the fact he has left a lasting impression on the continent.